A neck injury can be debilitating and take a major toll on your life. It can leave you in life-long pain, in need of surgery, unable to work, and even unable to do every day activities you once enjoyed. Neck injuries can also progress over time and impact your life years after an injury. If you have been the victim of a neck injury, it is in your best interest to seek legal advice and guidance before you agree to any settlement. Stephen M. Forlizzi is a dedicated injury lawyer in Massachusetts and has over 30 years of experience helping Massachusetts victims who have suffered injuries. A devastating and painful neck injury can be the result of a work accident, car accident, or a slip and fall accident. Once you have sought help, you might have questions about your rights and what kind of compensation you might need. We can offer a free consultation to answer those questions. We understand the toll a serious whiplash or neck injury can take and we also understand you need results quickly. Our firm will work tirelessly to get a fair and timely resolution. Our firm will gather evidence, medical documentation for a workers’ compensation claim, and do all we can to build a strong case. We will negotiate with any parties necessary to make sure you get what you need to move forward. 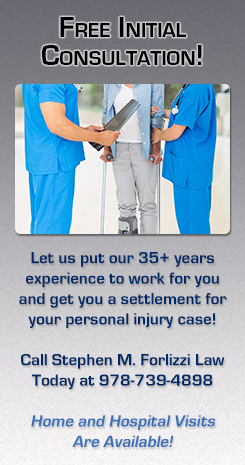 We can also be there to help you file for an appeal if your workers’ compensation claim is denied. Once we take on your case, we will be there to answer questions, keep you updated on progress, and be of assistance in any way. Let the Law Firm of Stephen M. Forlizzi focus on getting you the benefits you need while you focus on your recovery. As your legal advocate, our goal is to help you get through this difficult time and help get the compensation you need and deserve. Contact us for a free consultation to see if we can help you win a settlement for your motorcycle injury case. Home and Hospital Visits Available! 978-739-4898.